The Hawaiian and Kumato strains of Mycobacterium lepraemurium were cultivated on Ogawa egg-yolk medium, and the α-ketoglutarate dehydrogenase activity was investigated in cell-free preparations of this mycobacterium. The enzymatic activity was mainly localized in the particulate fraction (150,000 × g pellet), and extremely low activity was found in the soluble fraction (150,000 × g supernatant). a-Ketoglutarate dehydrogenase was not stable; the activity was lost completely when the enzyme was kept at 45ºC for 1 hr or stored at -70ºC. The enzyme reduced only NAD+ but not NADP+ by α-ketoglutarate, indicating the presence of NAD+-dependent a-ketoglutarate dehydrogenase in cultivated M. lepraemurium. On a cultive les souches Hawaiiennes et Kumato de Mycobacterium lepraemurium sur un milieu d'Ogawa à base de jaune d'oeuf, et 1'activité α-cétoglutarate déshydrogénase a été étudiée dans des preparations acellulaires de cette mycobactérie. L'activite enzymatique était surtout localisée dans la fraction particulaire (150.000 × g "particulaire"), et une activité extrêmenent basse a été observée dans la fraction soluble (150.000 x g "surnageant"). L'-cétoglutarate-déshydrogénase n'était pas stable; l'activité disparaissait complètement lorsque l'enzyme était conservé à 45ºC pendant une heure ou stocké à - 70ºC. L'enzyme réduisait seulement le NAD + , mais non le NADP+ par l'-cétoglutarate, ce qui indiquait la présence de NA D + dépendant de l'a-cétoglutarate déshydrogénase dans le M. lepraemurium cultivé. Las cepas Hawaii y Kumato de Mycobacterium lepraemurium se cultivaron en medio de Ogawa con yema de huevo para medir la actividad de la deshidrogenasa del ácido alfa cetoglutárico en preparaciones libres de células de esta micobacteria. La actividad enzimática se localizo principalmente en la fracción particulada (sedimento a 150,000 × g) y fue extremadamente baja en la fracción soluble (sobrenadante a 150,000 × g). La deshidrogenasa dei ácido alfa-cetoglutárico no fue estable y su actividad se perdió completamente cuando la enzima se calentó a 45ºC durante 1 hora o cuando se almacenóa -70ºC. La enzima redujo sólo al NAD+ pero no al NADP + , indicando que M. lepraemurium cultivado in vitro contiene una alfa-cetoglutarato deshidrogenasa dependiente de NAD+. α-Ketoglutarate dehydrogenase is an important enzyme of the tricarboxylic acid cycle (TCA) which plays an important role in the oxidation reduction reactions of the cycle. The oxidative decarboxylation of a-ketoglutarate is catalyzed by this enzyme. While Mori, et al. (11) were unable to detect a-ketoglutarate dehydrogenase activity in cell free extracts of in vivo -grown Mycobacterium lepraemurium, we have shown the occurrence of this enzyme (1) in the hostgrown bacilli. However, when in vivo- grown cells were used, it was argued whether the activity reported was not due to the presence of host tissues, although in very small amounts, in the purified preparations used during such studies. Although, M. lepraemurium has been cultivated on egg-yolk medium (4,10,13) the presence of α-ketoglutarate dehydrogenase has not been reported in the in vitro -grown cells. The TCA cycle has been reported to be generally incomplete in microorganisms lacking a-ketoglutarate dehydrogenase (2). In view of the importance of this enzyme, its presence in the in vitro -grown M. lepraemurium was investigated. Microorganisms. The Hawaiian strain of M. lepraemurium used in these studies originally was obtained from Dr. P. Greenburg (La Roche Research Laboratory, Nutley, New Jersey, U.S.A.). The Kumato strain of M. lepraemurium was kindly provided by Dr. T. Mori (Department of Leprology, Osaka University, Osaka, Japan). Both strains were maintained in Sprague Dawley rats or C3H mice by subcutaneous serial passages every 4-6 months. In vitro cultivation of M. lepraemurium strains. Primary as well as successive subcultures of both the Hawaiian and Kumato strains of M. lepraemurium were obtained on Ogawa egg-yolk medium as described earlier (4). Malachite green, which interferes with spectral studies, was added to the medium to obtain primary cultures, and was omitted from the medium to obtain subcultures. Preparation of whole cell suspensions of M. lepraemurium. The growth of the fourth subcultures from the surface of the egg-yolk medium was removed and suspended in 0.05 M sodium potassium phosphate buffer, pH 7.0. The suspension was centrifuged at 10,000 x g for 10 min at 4ºC in a Beckman J-21B centrifuge. The pellet was washed twice more, and cell-free extracts were prepared as described below. Preparation of cell-free extracts. To prepare cell-free extracts, the cells were suspended 1:4 w/v (wet weight) in a medium containing 0.1 M tris-(hydroxymethyl) aminomethane buffer, pH 7.0, 0.3 M sucrose, 0.005 M ethylenediamine tetraacetic acid (EDTA-Na2), 0.05 M MgCl2-6 H20 and 0.005 M reduced glutathione. The suspensions were passed twice through a chilled Aminco-French Pressure Cell at 18,000 psi (1 psi = 703.07 kg/m2). The homogenate was centrifuged at 20,000 x g for 30 min in a Beckman J-21B centrifuge. The resulting supernatant was used as the cell-free extract. To obtain particulate and supernatant fractions, 20,000 x g cell-free extracts were further centrifuged at 150,000 x g for 120 min in a Beckman model L-65 ultracentri- fuge using the rotor type 50 Ti at 2ºC. The resulting supernatant was used as the 150,000 x g supernatant fraction, and the pellet, after washing once, was suspended in an appropriate volume of buffer, pH 7.0, and used as the 150,000 x g particulate fraction. To avoid contamination with other microorganisms, sterile equipment and solutions were used in aseptic conditions throughout this study. Determination of α-ketoglutarate dehydrogenase activity. Since the cell-free extracts of M. lepraemurium contained NADH oxidase activity (6), direct quantitative measurement of NADH production was not possible. Thus, a coupled assay system used by Wheeler (14) to measure this enzyme in cell-free preparations of M. leprae was used. This assay is based on coupling the NADH produced to reduction of the dye 2 (p-iodophenyl) 3-p-nitrophenyl-5-tetrazolium chloride (INT). The reaction mixture in a total volume of 2 ml contained 50 mM potassium phosphate buffer, pH 7.0, 0.1 mM coenzyme A, 0.33 mM thiamine pyrophosphate, 1.5 mM MgS04, 0.33 mM NAD, 0.6 mM INT and enzyme (2 mg protein). The reaction was initiated by the addition of 5 mM potassium α-ketoglutarate to the sample cuvette, and an equal volume of water was added to the reference cuvette. The absorption was measured at 500 nm at 32ºC in a Carry model 118C dual-beam spectrophotometer equipped with temperature controlled compartments. In this assay, the NADH produced is related to the INT produced and the activity is expressed as /umoles/hr/mg protein. Each assay was performed at least twice with the results expressed as an average value. Protein determination. Protein concentration in cell-free preparations was determined using Folin-Ciocalteau reagent by the method of Lowry, et al. (9). Crystalline bovine serum albumin was used as a standard. The presence of α-ketoglutarate dehydrogenase has been demonstrated in cultivable mycobacteria which use the TCA cycle for respiratory metabolism rather than only for biosynthetic needs (3,12,16). Wheeler (14,15) has demonstrated the presence of all enzymes of the TCA cycle including α-ketoglutarate dehydrogenase in extracts prepared from NaOH-treated cell suspensions of host-grown M. leprae and M. lepraemurium. M. lepraemurium can now be cultivated in vitro, and enough cells free from any contamination can be obtained. (4). This report shows α-ketoglutarate dehydrogenase activities in freshly prepared different fractions of the in vitro- grown Hawaiian and Kumato strains of M. lepraemurium. Particulate fractions (150,000 x g pellet) of both strains exhibited a-ketoglutarate dehydrogenase activity (Figs. 1 and 2, curves B). The activity of this enzyme was slightly higher in crude cell-free extracts (Figs. 1 and 2, curves C) than in those obtained with the 150,000 x g particulate fraction. The soluble fraction (150,000 x g supernatant) of both strains showed extremely low activity of α-ketoglutarate dehydrogenase (Figs. 1 and 2, curves A). Reaction mixtures without substrate and heat-inactivated bacillary fractions were completely devoid of any activity. 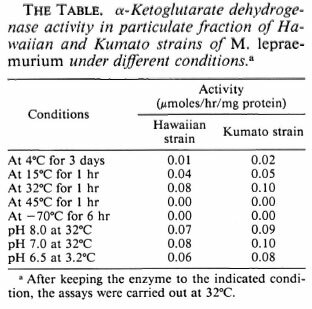 Fig 1. α-Ketoglutaratc dehydrogenase activities in(A) 150,000 g supernatant fraction, (B) 150,000 x g particulate fraction and (C) x 20,000 x g cell-free extracts of in vitro -grown Hawaiian strain of Mycobacterium lepraemurium . Reaction mixture in 2 ml mixture contained 2 mg protein. Fig. 2. α-Ketoglutarate dehydrogenase activities in(A) 150,000 x g supernatant fraction, (B) 150,000 xg particulate fraction and (C) 20,000 x g cell-free extracts of in vitro -grown Kumato strain of Mycobacterium lepraemurium. Reaction mixture in 2 ml contained 2 mg protein. The activity of α-ketoglutarate dehydrogenase in extracts of in vitro -grown M. lepraemurium was low compared to other mycobacteria (12,16) . Wheeler also reported that most of the enzymes of the TCA cycle in extracts of M. leprae have ten times less specific activities as found in other mycobacteria. This could be one of the reasons why the growth of M. leprae and M. lepraemurium is so slow. 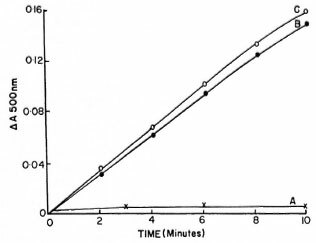 Generally, there is a correlation between the rate of activity of an enzyme and the rate of growth of a microorganism in a synthetic medium. In vitro -grown Kumato strain M. lepraemurium always showed higher activities of α-ketoglutarate dehydrogenase. It was observed that the rate of growth of the Kumato strain was relatively faster than the Hawaiian strain. The results show that the α-ketoglutarate dehydrogenase activity in both in vitro -grown strains of M. lepraemurium was quite low and principally associated with the particulate fraction and, to a very small extent, with the soluble fraction. α-Ketoglutarate dehydrogenase activity observed with the soluble fraction of in vitro -grown strains of M. lepraemurium can be attributed to an incomplete resolution of particulate and soluble fractions, since the soluble fraction obtained after 300,000 x g for 3 hr did not show any activity for this enzyme (results not shown). a-Ketoglutarate dehydrogenase activity in the in vivo -grown M. lepraemurium also was found to be completely associated with the particulate fraction (1). The highest activity of α-ketoglutarate dehydrogenase was obtained at pH 7.0 and at 32ºC. A temperature sensitivity of the α-ketoglutarate dehydrogenase was observed when the particulate fraction was allowed to stand for 1 hr at various temperatures (results are presented in The Table). All activity was lost at 45ºC and only 50% of the original activity was obtained when the enzyme was kept at 15ºC. The stability of the enzyme (particulate fraction) was investigated under different storage conditions. When the particulate fraction was stored at 4ºC and examined daily, 80% of the original activity was lost over a 3-day period. The enzyme was unstable to freezing, since no activity could be detected after freezing the particulate fraction at -70ºC for 6 hr. Attempts were made to purify the enzyme by the addition of ammonium sulfate, but without success. It is likely that the low activity of the enzyme and complex requirements of co-factors made it impossible to detect it after ammonium sulfate precipitation. The enzyme α-ketoglutarate dehydrogenase detected by Wheeler (14) in extracts of host-grown M. leprae and M. lepraemurium was found to be NAD- and NADP-dependent. However, cell-free extracts and particulate fractions, prepared from in vitro- grown M. lepraemurium, reduced only NAD+ but not NADP+ in the presence of α-ketoglutarate, indicating the presence of NAD +-dependent a-ketoglutarate dehydrogenase. Unlike most other biological systems, α-ketoglutarate dehydrogenase of M. tuberculosis has been shown to be NADP+ dependent (12). The results obtained with the in vitro -grown M. lepraemurium indicate that α-ketoglutarate dehydrogenase of this mycobacterium ensures a constant production of NADH as a reducing agent for its metabolic processes, and the presence of NADH oxidase ensures that sufficient NAD+ is always available as an oxidizing agent required in the process (α-ketoglutarate + CoA + NADH → succinyl-CoA + CO2 + NADH + H + ). NADH oxidase has been shown to be present in the in vivo -(8) and in vitro -(6) grown M. lepraemurium , and such activity has been shown to be mediated through the electron transport chain. Respiratory components responsible for the oxidation of NADH in the in vivo -(7) and in vitro -(5) grown M. lepraemurium have been reported. Acknowledgment. This investigation was supported by Le Secours aux Lépreux, Canada, Inc., by the Military and Hospitaller Order of Saint Lazarus of Jerusalem, Canada, and by the German Leprosy Relief Association, Wurzburg, Germany. 1. Adapoe, C, Ishaque, M. and Kato, L. Occurrence of α-ketoglutarate dehydrogenase in Mycobacterium lepraemurium. Rev. Can. Biol. 35(1976)91-92. 2. Doelle, H. W. Aerobic respiration-chemoorganotrophic bacteria. In: Bacterial Metabolism. 2nd edn. New York: Academic Press, 1975, pp. 380-491. 3. Hunter, G. J. E. Acid formation in cultures of Mycobacterium butyricum J. Bacteriol. 66(1953)676-682. 4. Ishaque, M. In vitro cultivation of Mycobacterium lepraemurium and its identification by animal inoculation. Can. J. Microbiol. 27(1981)788-794. 5. Ishaque, M. Cytochrome system in cultivated Mycobacterium lepraemurium. Cytobios 39(1984)165-170. 6. Ishaque, M. Energy generation mechanisms in the in vitro grown Mycobacterium lepraemurium. Int. J. Lepr. 60(1992)61-70. 7. Ishaque, M. and Kato, L. The cytochrome system in Mycobacterium lepraemurium. Can. J. Microbiol. 20(1974)943-947. 8. Kato, L. and Ishaque, M. Oxidation of reduced nicotinamide adenine dinucleotide by particles of Mycobacterium lepraemurium. Cytobios 12(1975)31-43. 9. Lowry, O. H., Rosebrough, N. J., Farr, A. L. and Randall, R. J. Protein measurement with Folin-phenol reagent. J. Biol. Chem. 193(1951)265-275. 10. Mori, T. Biochemical properties of cultivated Mycobacterium lepraemurium. Int. J. Lepr. 43(1975)210-217. 11. Mori, T., Kohsaka, K. and Tanaka, Y. Tricarboxylic acid cycle in Mycobacterium lepraemurium. Int. J. Lepr. 39(1971)796-812. 12. Murthy, P. S., Sirsi, M. and Ramakrishnan, T. Tricarboxylic acid cycle and related enzymes in, cell free extracts of Mycobacterium tuberculosis H37Rv. Biochem. J. 84(1962)263-269. 13. Ogawa, T. and Motomura, K. Studies of murine leprosy bacillus. An attempt to cultivate in vitro the Hawaiian strain of Mycobacterium lepraemurium. Kitasato Arch. Exp. Med. 43(1970)21-36. 14. Wheeler, P. R. Oxidation of carbon sources through the tricarboxylic acid cycle in Mycobacterium leprae grown in armadillo liver. J. Gen. Microbiol. 130(1984)381-389. 15. Wheeler, P. R. Recent research into the physiology of Mycobacterium leprae. Adv. Microb. Physiol. 31(1990)71-124. 16. Yamamura, Y., Kusunose, M., Nagai S. and Kusunose , E. Studies on the tricarboxylic acid cycle in Tubercle bacillus. J. Biochem (Tokyo) 41(1954)513-528. 1. Ph.D., Professor; Applied Microbiology Research Center, Institut Armand-Frappier, University of Quebec, 531 Blvd. des Prairies, Laval, Quebec, Canada, H7N 4Z3. 2. M.Sc, Student, Applied Microbiology Research Center, Institut Armand-Frappier, University of Quebec, 531 Blvd. des Prairies, Laval, Quebec, Canada, H7N 4Z3. 3. M.D., F.R.C.P. (C), Professor, Ar- mauer Hansen Institute, Germany Leprosy Relief Association, D-97067 Wurzburg, Germany. Received for publication on 5 November 1993. Accepted for publication in revised form on 16 March 1994.